Most everyone is aware that becoming a physician is an extremely difficult process, which thankfully gives us top skilled doctors to look after our needs. Years of education, amassing great debts and sacrificing personal lives to reach a specific goal is a challenge few can rise to. Imagine how challenging that process must be for someone who did not start their career in medicine, but rather switched at a time when she had two toddlers at home and a very understanding husband. Dr. Kim Ferguson is that woman and she has successfully accomplished what very few people set out to do - a change in career from insurance sales to practicing medicine. Kim was born in Orillia. Her father, a salesperson and her mother, a bookkeeper, wanted Kim to go into business with a prominent firm where she would find security and live a traditional life. The family moved to Ajax and when Kim was two they relocated again, this time to Myrtle where Kim attended elementary school in Brooklin. Kim’s dad had always wanted to have a hobby farm and Kim enjoyed tending to horses, cows, pigs, dogs and dozens of bunnies. When Kim was about to head to high school her family moved to north Whitby away from the farm. Kim attended Henry Street High School and at 14 years of age, started her first part-time job at a real estate office where she worked on weekends. The following year she also worked at the Caddy Shack. Kim started as a clerk and by the end of high school was managing the enterprise. Surprisingly, Kim made time to date Randy Ferguson, whom she met when she was 16, and became engaged a year later. It was time for university and Kim enrolled in a business course at the University of Toronto. She made Randy wait until she was twenty before agreeing to marry him and her dreams of going into medicine drifted into the distance. Kim accepted a position with Tuxedo Royale in Pickering and when she and Randy moved to Blackstock it was time to get serious about a career. London Life was hiring agents and Kim applied and was hired. Two years later her son Matthew was born and three years after that Kim and Randy were blessed with a baby girl, Megan. Life was good, but Kim quietly regretted her decision not to follow her lifelong dream. The words sank in and Kim explained to Randy that she wanted to change careers. “I am so fortunate that Randy is an understanding person. When I told him of my wish he simply told me to do it.” Kim resigned from the life insurance business and attended Trent University, doing an undergrad in Biology and Psychology. Three years later she applied at all five medical schools and was rejected by four with no response from U of T.
One day, while in Toronto, Kim decided to call on the medical facility at U of T simply to enquire why they had not responded to her admission request. She was told they had and were waiting for her marks. Kim found the nearest phone, called Trent and asked to have her transcripts faxed. That September she started her first day of medical school. No doubt the Ferguson household was in an upheaval. “I was fortunate my mom lives with us and that Randy had a fair bit of time during the day to help with the kids,” Kim said. “I would stay in Toronto when I had to and commute home whenever I had the opportunity. The hectic lifestyle went on for four years and another year at Toronto East General. Thankfully U of T has a rural Family Medicine program where students have an opportunity to travel to small towns. Kim jumped at the chance of coming to Port Perry and recalls a conversation with Dr. Bill Cohoon who was ‘selling’ her on the benefits of working here. Secretly she is fondest of her obstetrical patients, but treats everyone with respect and care. You would think juggling a medical practice, two children and a husband would take up most of Kim’s time, but it seems there is more. As part of her practice, Kim works at the Urgent Care Clinic, assists in surgeries, performs minor procedures and along with eight other Docs, delivers babies. Every other week Kim heads up to the First Nation medical clinic on the island and spends a half day caring for local residents. 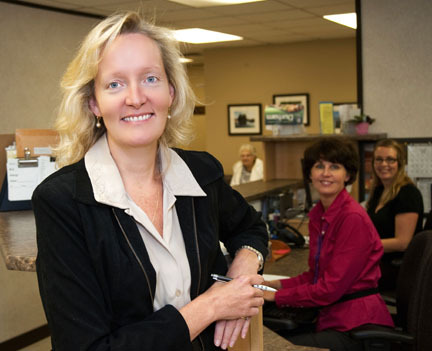 She is a heavily involved with LHIN (Local Health Integration Network). An (extremely worthwhile) organization which has the legislative power and authority to effectively plan, coordinate, and fund local health systems making it easier for patients to access the care they need. One of Kim’s roles is to attend meetings and review proposals for increased healthcare for our community. Kim is also involved with UPA (Unattached Patient Assessment Project) and along with a nurse practitioner and lawyer have developed a model for those people who do not have primary care. A team of retired physicians, nurse practitioners and nurses travel to rural locations to screen those patients and link them with any care they require, as well as trying to associate them with a primary care person. Kim is Director of Continuing Medical Education at the Medical Associates of Port Perry, a responsibility in which she brings education to the local physicians.